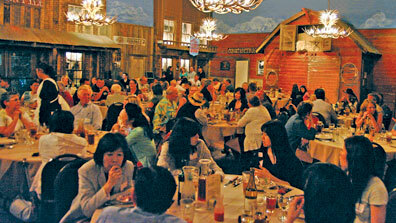 The Big E is the most versatile banquet and conference facility at the Grand Canyon. Two video screens for custom presentations, a dynamic sound system, and food & beverage menus to meet your budget and please your group. Custom entertainment packages are also available. Group Menus are available for groups of 10 to 200. The Big E Showroom can operate as a banquet room, performance theater, a presentation hall, or a state of the art conference center. Two large high definition projectors and screens (one in front of the stage and one at the rear of the room) allow for Power Point or video presentations. It is the largest permanent theatre video wall in the U.S. built from thirty 46” Samsung high definition video monitors with the clarity of an iPad. The sound system has over 10,000 Watts of concert quality 5.1 surround sound audio. Stage lighting has 50 color-changing wash lighting instruments - totaling 1850 individual LED light sources, 5 intelligent moving spot lights.